Grilled mini meatballs stuffed with jalapeno and cheddar cheese perfect for a cookout appetizer. Combine the beef, cheese, and jalapeno, then roll in to 14 meatballs. 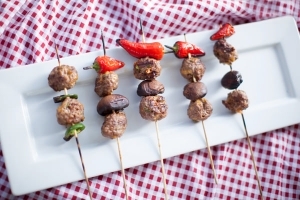 Put two meatballs and two mushrooms on each skewer. Grill about 7-10 minutes, or until 140-145 degrees F for medium doneness.